Large map of the Americas, published in 1720 by London cartographer Herman Moll entitled ''A New Map of the North Parts of America claimed by France under ye names of Louisiana, Mississipi, Canada and New France with ye adjoyning territories of England and Spain''. 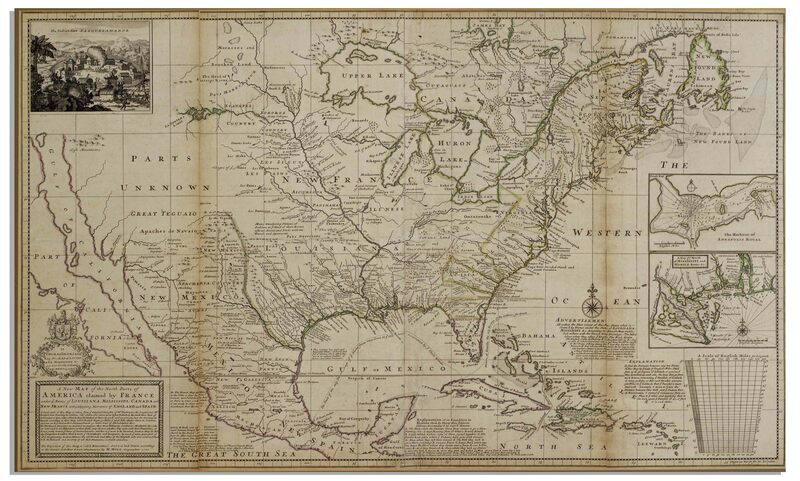 Engraved map incorporates the latest surveying of the Americas, such as a French expedition into Texas in 1716. Map is hand-colored at boundaries, featuring a vignette at upper left of ''The Indian Fort Sasquesahanok'', and with various ''Explanations'' of the map printed at bottom, including one of an Indian expedition into Florida, ''6 days Rowing''. Insets of the Annapolis Harbor and the mouths of the Mississippi and Mobile Rivers are also included. Map is published in four vertical sections, laid down on archival paper and mounted on board. Map measures 25'' x 40.75''. Minor browning at section lines and a few spots of buckling. An attractive map in very good condition, giving historical insight into the jockeying for land among the major European powers in the early 18th century.